Have a question on Focus? Focus is available in 14 different colors - Deep Impact Blue Metallic, Magnetic Metallic, Race Red, Moondust Silver Metallic, Blazer Blue, Frozen White, Tectonic Silver Metallic, Red Candy Metallic, Absolute Black Metallic, Caribou Brown, Iceberg, Stealth, Tangerine Scream and Tiger Eye. Watch latest video reviews of Ford Focus to know about its interiors, exteriors, performance, mileage and more. Ford revealed the Focus in Europe in July 1998, however made its global presence in the year 2000. After introducing this vehicle, the manufacturer have been giving its best effort in providing its customers the best deal for the money paid. Perpetual changes has been made to this car, showing it as one of the best family car in its class. For Middle East customers, Focus is made available with some appealing body styles such as an estate wagon and sedan. Also, this car offers tremendous driving experience that can turn an everyday ride into a savored experience. Ford Focus offers wide range of equipment in its arsenal for comfort of passengers that make them sit long and enjoy the ride. This car is provided with adjustable driver’s seat, front and rear head restraints with height adjustment to provide an ideal driving position. The automatic digital air conditioning system is also embedded to propose a desirable optimum temperature. The leather covered steering wheel is mounted with audio controls switches proposing easy functionality to the driver. Good music can make the ride even better, thus the Ford has employed Focus with a high-quality audio system featuring 4.2-inch multi-functional display, MP3 compatibility, a USB port, auxiliary input jack, 9 speakers and audio streaming. Ford Focus Sedan employs different measurement for boot space i.e. 421-litres in all the sedan variants. 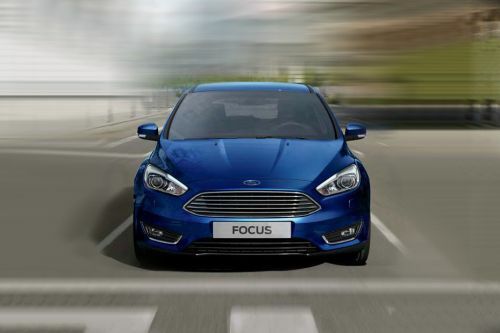 Ford is popular to fulfill every requirement of its customers, proving the statement, it has launched Focus that performs its everyday tasks amazingly, while serving up the driving thrills. The rear profile is the main highlight of its appealing design. With uplifted hood and boot cabin it reveals a new sense of classy exterior. The roof streamlines smoothly into the rear windshield and LED lights accentuates its looks. Front also looks striking by integrated headlamps in chrome-finish and LED daytime running lights. The available 16-inch, 17-inch and 18-inch alloy wheels offer better grip in high speeds and muddy surfaces to maintain the traction control. The overall measurements for Focus hatchback remains good 4358mm X 1823mm X 1484mm (L X W X H) with a decent wheelbase of 2648 mm making way for increased cabin volume. Ford Focus is offered in four trim levels named as Ambiente, Trend, Sport and Titanium. All of the variants are made available with a wide range of petrol engines options such as 1.6L Ti-VCT I-4 Engine, 2.0L GDI I-4 Engine and 2.0L EcoBoost® I-4 Engine. Also, 1.6L Ti-VCT I-4 Engine is coupled with 6-speed sequential transmission PowerShift for smooth handling and quick response on gear changes. The available petrol engine variants gives power output ranges from 123 hp to 247 hp, along with the peak torque varies in between 202 Nm to 346 Nm. The trim levels with 1.6-litre petrol engine takes the fuel consumption of 8.7 in urban driving, however the 2.0 litre GDI engine delivers 9.1 l/100km in same driving. Ford always keeps its passive control in providing its consumers the best safety elements. For emergency stopping, Anti-lock braking system (ABS) with Electronic Brakeforce Distribution (EBD) is embedded in the car, which also keep the vehicle in track while reducing the fatality on uneven road surfaces. Fast airbags system, along with ISOFIX child attachment ensures maximum safety of the driver and its occupants. Providing a hands-on confidence to the driver, the latest Ford is equipped with disc brakes for both front and rear pair of wheels. For decent suspension, this amazing car is provided with independent type McPherson suspension for the front and the rear suspension outfitted with independent multi-link suspension. The New Ford Focus is one of the most comprehensive cars in the auto markets with its decent performance, aesthetic design and premium build quality, Focus gives you everything you desire and at an affordable price tag. However, cramped rear seating due to its rear sloping styling in both sedan and estate wagon might effect its sale in the UAE market. What are the colors options available in Ford Focus?